Our church is taking part in a study called the Amazing Race, and as a church we are reading through the New Testament together until the end of the year. I thought I’d post my thoughts on the days readings, and I’d love to hear what you have to say. If you don’t attend SCC, I’d still love to invite you to read with us, and weigh in with what you are learning as well. 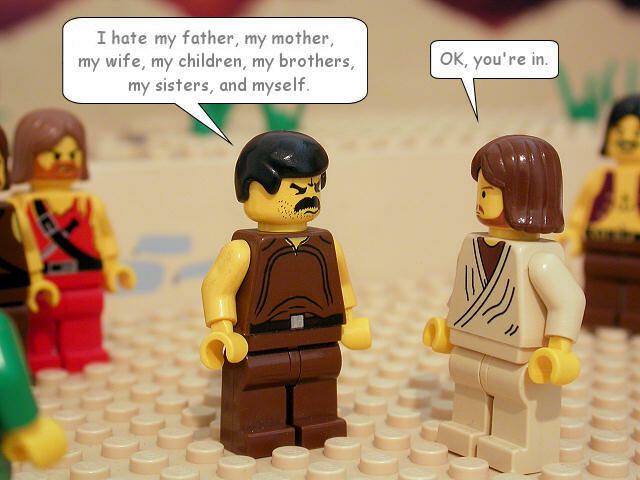 Today we read Luke 12:35-14:35. The stories we read today mostly center around Jesus and the religious leaders squaring off. At this point, the religious leaders want Jesus dead. They just don’t see any other way to stop Him from ruining everything. They know it, and Jesus knows it. What strikes me is the number of times Jesus heals someone, and does it on the Sabbath. The Sabbath is Saturday, and it’s the Holy Day of the week for a Jewish believer. The religious guys had developed a ton of rules on how you are supposed to rest. They had effectively turned rest into a full time job. One of the things they didn’t want done was for anyone to be healed on the Sabbath, because that was work. Remember, God gave us a Sabbath day so we could rest and keep our bodies, minds, and souls healthy. But if someone tried to heal someone’s body, mind, and soul on the Sabbath, that was wrong in their minds. So, Jesus just goes ahead and does it. It doesn’t make them happy. Obviously, we don’t have the legalistic issues that the religious leaders had on working on the Sabbath. But we do have issues with Jesus. Sometimes He wants me to forgive people, even when they haven’t asked for it. (Actually, that’s all the time.) Occasionally He will ask me to be generous with stuff that I want to keep for myself. (Well, He expects that everyday, to be honest). He can get crazy from time to time and want me to tell myself “no” about some action I want to take, and use self discipline. (That is really an expectation of His all the time.) I mean, sometimes He annoys me. Just like He annoyed the Pharisees. It’s all about whose Kingdom we live in. That is part of the reason you have the Kingdom discussion in the middle of all of these stories. Who is in charge of my life, of the religious leaders’ lives, of your life, anyway? That is the big question. Today, right now, take some time to talk with God about what it is that He does, expects, or commands that bugs you. Be honest, He already knows. You have nothing to lose. At least you don’t if you admit it. Act like everything is fine, and you’ll find yourself mad at Him for healing people all around you, when you can’t seem to be healed. It’s your, and my, choice. Previous Previous post: Here Comes the Hoo-Haa!